Doesn’t it seem like there are a lot of user experience groups on LinkedIn? I’ve joined a few of them in hopes of staying up-to-date on topics, but after joining a couple groups, I quickly realized there were many more possible groups, and they all started looking pretty similar to me. Why would I join this group versus that one? Some are tied to specific organizations, like the Information Architecture Institute, the Interaction Design Association, or the Usability Professionals Association. Or like the Boxes and Arrows group, related to a specific industry publication. If you are a member of such an organization, joining the matching LinkedIn group probably makes sense in some way. Some are focused on narrower subjects, like the Agile Experience group or mobileUX. If you have a narrower interest and find a group that fits, perfect. Some differentiate by being localized. The UPA Israel, for instance, or London User Experience Professionals. Cadius is a group for UX people who speak Spanish. I think that’s fantastic. But then we have all those other groups that ooze together, subject-wise. I’ll bet each has its own creation story, but at this point, the differentiation is slim. Don’t these top 5 UX LinkedIn groups sound similar? The second item is the group for members of IxDA, but the rest are simply professional groups for UX people. I’ll bet if you mixed together all the content and members of those groups you would first see a lot of repetition in members and topics, and second, I’ll bet you couldn’t separate them back into their original groups without a key. What does that say about these groups? The following data is merely what I found this afternoon. It is not comprehensive. 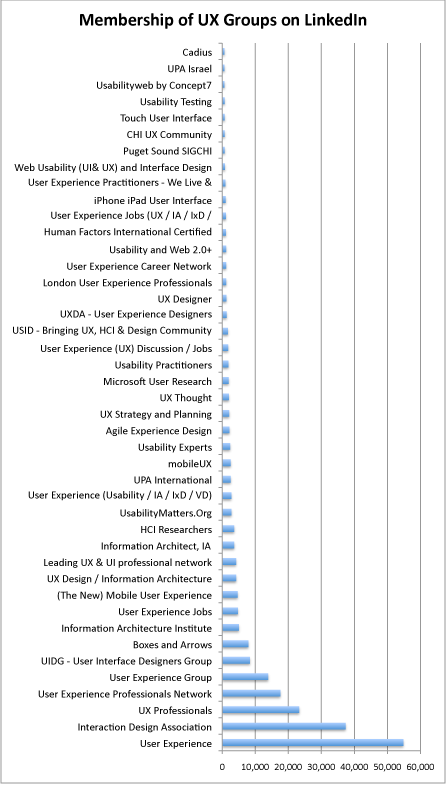 Chart showing membership rates of about 40 user experience groups on LinkedIn as of March 11, 2012. Want a little more information? You can download an Excel spreadsheet I used while gathering this information. The worksheet includes columns for ID, Title, Membership, Parent Group, Created date, Type (e.g., Professional Group), Owner, Coverage (e.g., Earth, Greater London, UK, etc. ), Language (didn’t fill that in), and Organization (e.g., IxDA). In closing, I think it would be easier and less time consuming to stay up-to-date in the field if there weren’t so many overlapping groups. What if some of these groups merged? Would people get too upset about that?